The great thing about doing these Giro updates weekly is that it keeps a great deal of my daily wrongness safely out of sight. The final week brought many surprises, not least of which was stage 19, almost the whole of which I am going to officially classify as “fully bonkers”. Everyone had been waiting for the time trial. If Tom Dumoulin could get far enough ahead of Simon Yates then maybe he could just about hold on in the mountain stages to come – that was the thinking. Such an outcome didn’t seem likely given Yates’s form, but it was something to cling to if you wanted a bit of tension in the final week. As it turned out, Dumoulin didn’t even manage to take the race lead. 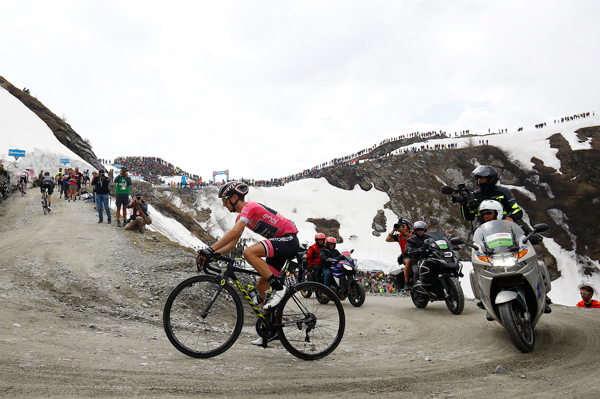 Yates rode well enough to retain it and the Giro seemed, to all intents and purposes, over. Turns out the Giro wasn’t over. ‘Will Simon Yates ever tire?‘ I asked on the third rest day. The answer to that question was ‘yes’. Three summit finishes on the bounce seemed to provide the Bury Bullet with ample opportunity to increase his 56 second lead over Tom Dumoulin. It didn’t really pan out that way. After the first one, that lead had been halved. The Dutchman attacked with about 1.5km but couldn’t initially shake the race leader or third-placed Domenico Pozzovivo. Shortly afterwards, Chris Froome caught up with the trio – and then he attacked. It was here that the magic ended. Yates could not follow them. It’s amazing how quickly three summit finishes in succession can go from seeming like a wonderful opportunity to a hellish nightmare. 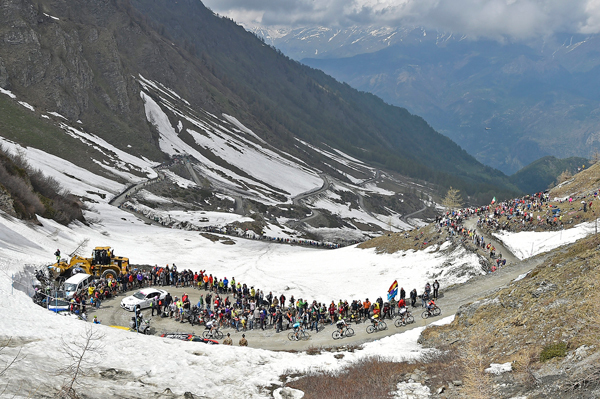 Stage 19 brought the Colle delle Finestre. This delivered the highest point in this year’s race and as you’d imagine, it was a bit of a slog to get there. The climb is 18km long and averages 9%. There are 45 hairpins – and let me tell you, only a fraction of that number is quite sufficient to make a baby vomit while travelling in a car. The top half is on gravel too, just for good measure. The climb also came halfway through the stage with two more climbs to follow. In short, if you’ve shown faint signs of weakness the day before, the Colle delle Finestre is not a place where you want them to be further explored. Yates was dropped early and very quickly lost minutes and also the Giro d’Italia. “After the time trial, I’ve not recovered since then,” he said afterwards – so turns out the race against the clock WAS all-important. Just not in the way we all expected. And he really was tired. By the end of the stage he’d lost 39 minutes. 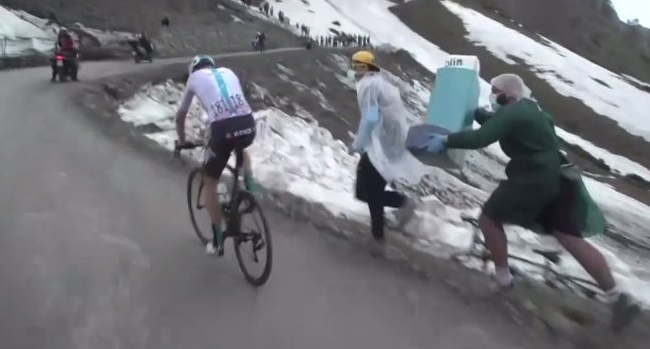 Chris Froome, meanwhile, went on the rampage. The Team Sky man went on a mad attack with 80km to go. He was so focused he barely even noticed some spectacularly impressive roadside goading about his Salbutamol case from a couple of fans who came extraordinarily well prepared. 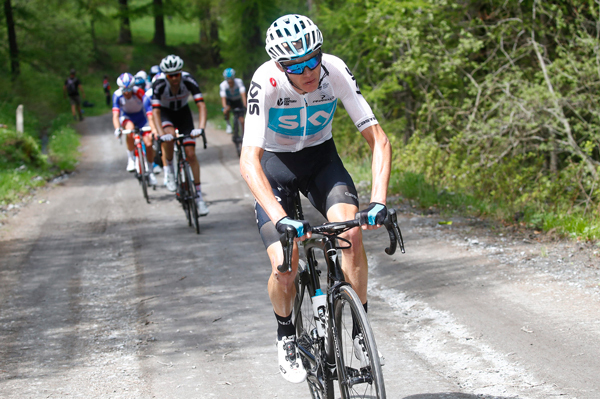 By the summit of the Colle delle Finestre, Froome was 42s ahead of Dumoulin and several other major rivals. Domenico Pozzovivo had sadly also been dropped – the Italian lost fewer minutes than Yates, but still lost plenty. 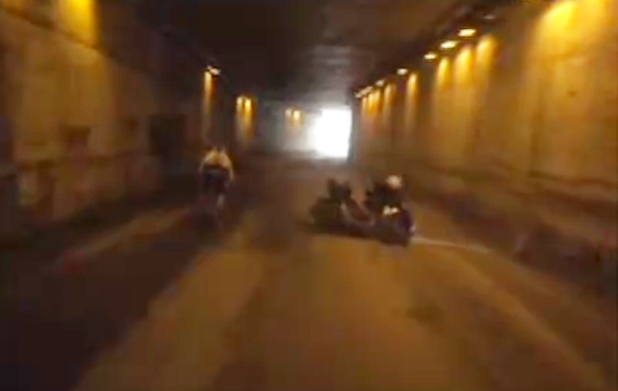 On the subsequent descent, Froome gained another 50s on Dumoulin, at one point skipping round a race motorbike that had crashed in a tunnel. Next up was the climb to Sestriere and this saw his advantage grow by another 40s. 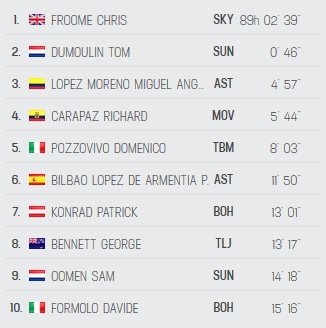 Chris Froome was on it. The key to the performance was creating an “every man for himself” scenario. The pace low down on the Finestre had been so hard that long before the summit there were only small uncooperative groups dotted along the road. A small group where no-one wants to help each other is actually less effective than one guy riding on his own. Nevertheless, this kind of thing takes some effort and by the finish, it was largely about holding on for Froome – but hold on he did. 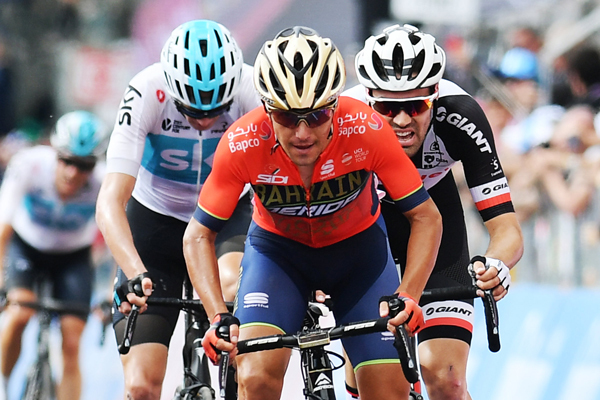 His demented and optimistic attack with near-enough three climbs to go saw him finish three minutes ahead of second-place Richard Carapaz and 3m23s ahead of Dumoulin. Having started the day 3m22s behind, Froome somehow ended it 40s ahead and there was only one stage to go. The idea is that Froome’s arrived fresh and will be strongest in the third week. If it really does pan out that way then he could still win the Giro. It’s all well and good being Simon Yates, racing away from everyone every chance you get in the first week because the simple fact is that there were really only these two chances to make use of the good form. If this was Yates’s best week, he’s spent most of it waiting for steeper roads, which is not a very productive use of one’s supremacy. And now I’ll tell you how I managed to deliver this uncanny vision of the future: through blind luck and hedging my bets. I’ve written plenty of things about what might happen in this race and that was just one of them. 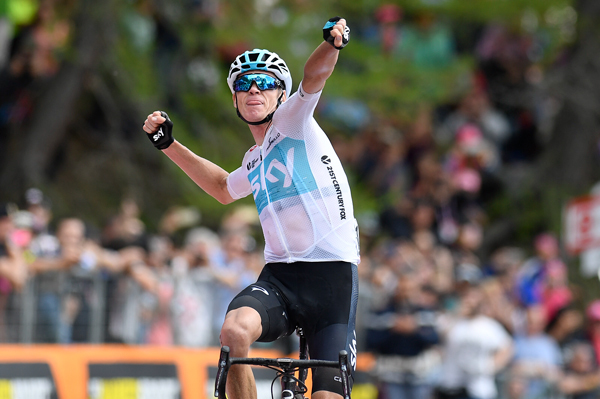 There were attacks, they didn’t stick, Froome held off Dumoulin and won the race overall. This was no mean feat when you think back to the start of the race and remember that he kicked things off by crashing in the stage one warm-up. The most striking development on stage 20 was actually Thibaut Pinot taking a turn at implosion, getting dropped on the first climb and tumbling off the podium. He actually managed to improve on Simon Yates’s terrible effort and lost 45 minutes. This meant Miguel Angel Lopez finished third. In all honesty, I don’t think there’s going to be much going on this site until the Tour de France from July 7. After last year’s Tour, the Vuelta a Espana and this, Chris Froome has now won three Grand Tours on the bounce. Can he make it four? That’s a question for another day, but with a tough Giro in his legs and rivals who’ve trained purely for the Tour, it’s a big ask. But then so was winning this Giro from three minutes behind with two stages to go. I wouldn’t be placing any bets either way.